Landmark Melbourne pub and live music institution The Corner will officially reopen its rooftop on Friday 11 November following substantial renovations. The historic venue has stood on the corner of Swan Street, Richmond, since the nineteenth century and has been a popular live music venue since the 1940s. Remodelled and developed by Tim Northeast and Mathew Everett in 1995, the venue has since played host to some of the most prestigious names in music, both locally and internationally. 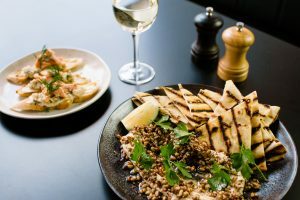 Now, just in time for its 20th anniversary under current ownership, The Corner reveals its spacious new rooftop, with an indoor dining area, outdoor courtyard and private function spaces, plus an impressive new menu and bar offering. The Corner’s rooftop redevelopment is grounded in its ongoing commitment to loyal patrons as well as to future generations. Designed to produce the best experience for all patrons, the new rooftop is a reinvestment in the next 20 years of great food, drinks, service and music at The Corner. “It’s really exciting to be celebrating our 20th year at The Corner with a major renovation of the rooftop designed by Therefore Studio . Live music is in our DNA. While The Corner will continue to host the best local and international touring acts in our band-room, we think The Corner rooftop will become known as a great food and bar destination in its own right,” says co-owner Tim Northeast. The Corner’s Head Chef, Shannon Rice, has put together a new menu of premium pub food with a new focus on shared dishes. Comforting classics rub shoulders with delectable share dishes such as the whole smoked pork hock with apple and caraway slaw, pickles, mayo and mini milk buns; or the whole roasted eggplant with quark, lemon herb toasted almonds, house made flatbread and pomegranate molasses. The new late-night menu includes tasty bar bites and snacks that perfectly complement the front bar’s substantial beverage offering, including a luscious new wine list. Vegetarian options are also plentiful across all menus, including the roasted bloody beetroot salad with blue lentils, rye grain, barley, caramelised walnuts, goat’s cheese and herbs. Lunch and dinner will now be available from Tuesday through to Sunday. The redesign sees former upstairs offices converted into public spaces for general use or for function hire. The converted spaces are fully flexible to suit different occasions – be it a luncheon in the dining/meeting room or a function in the larger space, which features a flexible layout, separate food and drink packages and a private bar. The Corner puts punter comfort first: the rooftop is completely wheelchair accessible and features more service space and seating throughout. The new outdoor space is calling out as the perfect daytime drinking and dining destination, featuring a non-smoking courtyard and an exciting new outdoor kitchen and barbecue. Ample outdoor heating means that city views can be enjoyed when the sun goes down, while the indoor dining area features two fireplaces, ensuring that patrons stay cosy and warm in the colder months. The Corner will re-launch the new rooftop on Friday 11 November and will celebrate with DJs, an outdoor barbeque and drink specials – the perfect opportunity to christen the new space. Later in the month, The Corner’s 20th anniversary will take place on Sunday 20 November with another free public event. DJs will ensure that the rooftop is in full swing while downstairs sees live music in the band room and acoustic acts in the front bar.